This week we’re launching a new meditation, Connect with Your Quiet Place Inside. It honours the importance of time to be calm, centred and quiet but also that the quiet place is found inside ourselves. Seeking to live our lives mindfully offers many rewards. Without doubt, we are offered opportunities to feel calmer and more centred. It also offers opportunities for self-discovery and by extension, in the quiet times when we seek solitude. But somewhere lurking just below the surface of this outward calm, there is a little storm brewing. Inwardly I can feel my inner child struggling with the anxiety of exposure, for exposure is surely what will happen as surely as the sun will rise tomorrow. We're excited to present to you this week a new guided meditation for kids, Watch Waves, perfect to be shared with the children in your lives at home or in the classroom. Like our other free guided meditation for kids, Go Walking in Nature, it was created as an extension of our book, Making Mindful Magic, with both meditation audios available by signing up to our newsletter at the end of this post! Guided meditations are a wonderful tool for transporting you into a space that for one reason or another we are unable to access all the time whilst also allowing us the opportunity to benefit from the experience, to promote deep relaxation and a sense of calm that we can carry into our everyday lives. If you are a teacher, this meditation would be a very useful post-lunchtime activity to bring the children back into focus and into a calm place to re-engage with the learning process. If you’re a parent, try using this meditation before bed to promote restful sleep or anytime calm and peace is especially needed. Below is the accompanying verse from the book upon which the meditation is based. Waves crash, water moves back and forth, but your own mind can be very still amongst it all. A sense of deep calm can be summoned in the midst of this wild activity. This is good training to connect to your inner self despite what may be happening around you. This then is the essence of the guided meditation – focusing on both watching and listening, using your senses to connect deeply with yourself and the world around you. Like all meditation, guided or otherwise, we begin by deep breathing to focus on the exercise and to encourage a relaxed, stress-free state. We then transport ourselves to a place in nature, very near the beach and use our senses to really notice our surroundings all the while practising our skills of mindfulness. We journey to the beach and focus on the movements and sounds of the waves to maintain our journey into mindfulness and a subsequent calm and peaceful state. 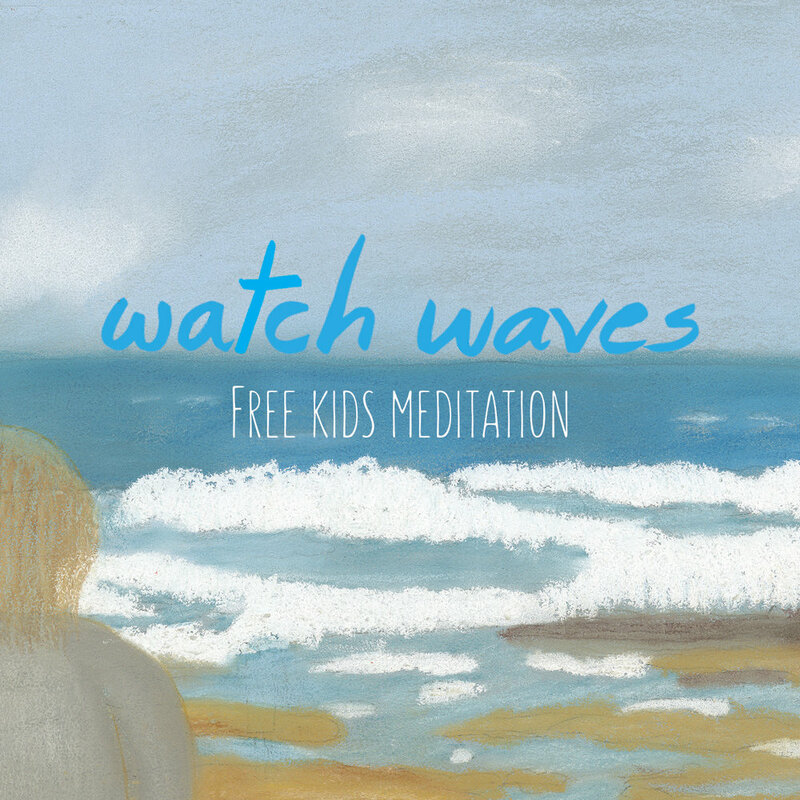 DOWNLOAD YOUR FREE KIDS GUIDED MEDITATION, Watch Waves, below by signing up for our monthly mindfulness tips for you, your family or your class. You'll also receive the FREE download of the audio file for our Walking in Nature Meditation and two FREE printable eBooks, Seven Day Challenge to Calm Nights and Mindful Seven Day Challenge for kids, perfect for parents and teachers to use as a resource for home or class! Music as a practical tool for meditation and mindfulness is an obvious concept when you stop to consider it. When I even think of music and how I interact with it, I immediately feel more grounded and more centred in my own heart. There are many ways to invite music into our lives, not all of them are mindful although all are certainly joyful and advantageous. Music is often a backdrop to many other things we are currently doing and that is a totally valid expression of our love for music. It soothes and relaxes or invigorates and excites, depending largely on what we are listening to. But music used as a mindfulness practice is something a little different. If a musician or student is interacting with their instrument in the act of music making, it is essential to focus fully on playing the piece – present moment engagement comes with the territory and some even liken it to meditation so akin is it to the essence of mindfulness! You can read more about that idea here. If you are listening to music then you can listen on a superficial level, with the piece playing in the background as you go about your many other activities and that is most definitely a valid way to use music in your life. It is uplifting to envelope ourselves with beauty and it is an appropriate addition to many situations, socially or individually and is how many people generally interact with music – for fun and enjoyment! The other way you can listen to music is to engage with it very mindfully, focus on it only, doing nothing other than listening to it, allowing it to engage with us fully and to evoke the emotional responses that allow us to focus on our inner selves. In this article there is great advice about ways to prepare ourselves for this type of interaction with music. Put simply we need to remove possible and real distractions from the physical situation so we are best able to really allow ourselves to feel the music and feel our emotions arise. We may need to look at our physical environment, seeking a quiet place, making sure we are physically comfortable. This is not only for adults but using music as an emotional response can be cultivated in children from an early age. In our Seven Day Challenge for Calm Nights eBook available for download here, we suggest listening to music as a path to a better night’s sleep. In this situation music is a calming, relaxing tool, an emotional experience when there is mindful engagement with a piece of music. In other ways music can also be used as an evocative method to connect with our emotions as a form of therapy as we allow our emotions to rise, to be held in the safety of the beauty of the music and to let those emotions fade away in the same way as a wave rises and falls. Positive and negative emotions may arise at different times. A physical response can be involved, perhaps the music calls you to move – sometimes in celebration and other times as a physical release for something difficult in your life. It can be incredibly healing and cathartic. Music has played a changing role in my own life. I was at one time living a life with so much noise that I felt music was an intrusion into my personal space and psyche. When things changed and my life slowed down and became less chaotic the music joy came back to me, uplifting me as it is so capable of doing. Music soothes me, it entices me to move and when I move, emotions and feelings surface and come to peek out at the world. The world heals us if we let it. Music can heal and restore. I guess the conclusion of this personal observation is to make space in your life for music, set aside some special time for real interaction with it as you use it as a tool for the whole family to move forward into mindfulness. Developing a routine of self-reflection is beneficial for adults and children alike. Making time for self-reflection and self-awareness activities for children at home and in the classroom helps kids to gain a better understanding of both the world around them and especially themselves. I love this quote from Jennifer Porter, ‘Reflection gives the brain an opportunity to pause amidst the chaos, untangle and sort through observations and experiences, consider multiple possible interpretations, and create meaning.’ A lot goes unnoticed without time for reflection, many opportunities are lost to assimilate what happens into our thought process without it. If we quieten our minds enough to allow self-reflection we can also grow in our understanding of ourselves and this helps us move towards self- acceptance and self-love which are so very important to our emotional health and well-being. Children’s need for this is as great as adults and what a gift to them and the society they will be functioning in as adults, to be making space for self-reflection from an early age. If children are encouraged to believe self-reflection is not only acceptable but necessary, then we are all winning. 1. Be a good example as an adult. Do you project the image of the adult in their lives who is always busy, always having to do, rather than be? Are you the person who sits and reflects without any agenda? If you are then bravo! If you aren’t, then think about making time in your own life for self-reflection and tell your children that are you are having quiet reflection time. 2. Help them find the time in their own lives. Don’t schedule every second of their lives or be perturbed that they may be bored if they have free time – it is every child’s right to be bored and to fill it with time just to reflect and to be! 3 Make a Family Time for self-reflection – it can be part of a sit and do nothing time or it can come with a simple question – maybe thinking about how you feel now or how you felt during your day? Start small, like 2 minutes and build it up from there. 4 Make journal writing a part of their routine. Very young children can use non-written ways to write a journal, drawing about their feelings or dictating to a parent can be used if they are too young to write themselves. You don’t have to solve the problem, you can be merely the one who gives comfort and validation to a feeling. It can of course be about positive feelings, not just difficult ones. It may be a time when they can accept a situation or decide they can do something about it. What is important is they know its ok to self-reflect and ponder life. They will love the independent and powerful feeling it gives them! 5 Encourage gratitude Ask the question often, ‘What are you grateful for?” You can start by sharing what you are grateful for so they get the ideas. This notion of gratitude can often put in perspective those difficult situations as being perhaps not as huge as they may have thought when weighed against the positive things in their lives. Self-reflection helps us realise some things are out of our control and need to be accepted as a part of our life’s journey. It gives us the space to recognise who we are and to, therefore, accept and love ourselves. It can steer us into thinking what it is about our life that makes us happiest, who are the people and experiences that give us the most joy and peace in our lives. If we are comfortable exploring who we really are then we can better use and trust our own guidance and intuition. Free time for thinking allows us to access that part of ourselves that we can so often deny, that part that keeps our hidden feelings, our hurt feelings, the ones we are always trying to keep down there deep inside so we don’t have to face them. Letting ourselves have time so they can come up and surface and to feel comfortable enough to sit with them and deal with them is a healthy habit to develop especially in a child as it can be carried into adulthood where the hurts from our childhood can fester! Self-reflection is for everyone! It’s a time for getting to know yourself better and to accept yourself. It’s not a time to explore the idea of being perfect, that leads nowhere positive but learning to accept and trust yourself is a gift best learned as early as possible! It’s school holidays in my part of the world and if you’ve been reading my recent blog posts you’ll know I recognise that a change in routine can be unsettling as well excitement inducing – not a great combination for calm bedtimes for young ones! With that in mind, we’ve created the 'Seven-day Challenge for Calm Nights' centred around activities that can help bring your kids back to a more balanced place, one that is calmer and less exciting and readier for a good night’s sleep. They are designed to focus minds in the present moment – a mindful progression to calmness and a better night’s sleep! Of course, it’s also perfect to use these experiences regularly – not just when we are out of routine. They can become part of establishing a routine for bedtime if that hasn’t been a big part of your household. Children need routine in their lives to help them feel secure and untroubled and the bed-time routine is one of the most important for a calm transition from the day’s busyness to a state of relaxation. As adults we can recognise this in our own lives – trying to sleep while we are still investing in our thoughts and worries does not a great night’s sleep make! Children, who these days lead busy lives themselves are also vulnerable to poor sleep and need to be encouraged to let go of the day’s activities to prepare for sleeping! Good sleep is one of life’s greatest gifts! 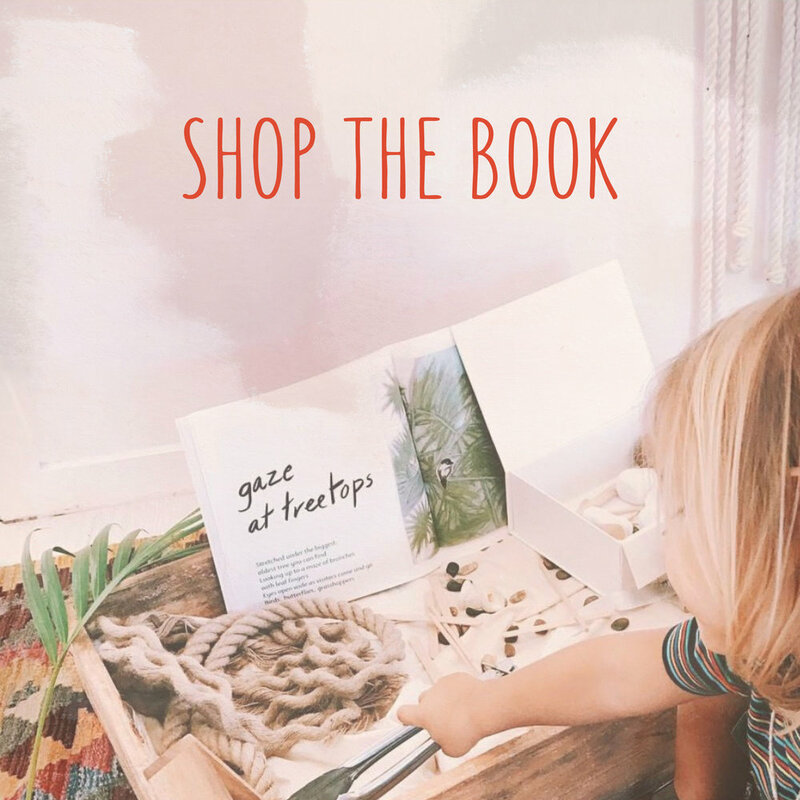 Here are a couple of tried and true things to start your routine – a bed time story (nothing too exciting)- we would, of course, recommend our book Making Mindful Magic (available here), a simple lullaby and hugs and kisses (of course) were favourites in my household! I created this lullaby to use with my own children when they were young. I’ve recently become acquainted with a couple of inspiring young women (www.thegoodnightco.com) who are making it their mission to improve quality of sleep. They have just launched into improving children’s sleeping and now have available a beautiful box called, Mind Time Kids in which they are using chakra clearing as a tool for helping kids get a better night’s sleep! We’ll be posting daily for the next seven days on our Instagram and Facebook pages an experience a day to promote calmer nights. Join us and Give these experiences a try and keep the ones that resonate with your family and build them into your night-time routine! You can modify this challenge any way you choose of course and use it over and over by finding different versions of the experience – eg changing the music used for listening or the mandala for colouring - it’s easy! You can incorporate any into a regular night-time routine – for holidays and any days! Enjoy, relax and sleep well! Alanna recommends these poses be done in this sequence with gentle slow breathing, for a few minutes each for children and up to 10-15 minutes for adults (great bedtime routine for everyone)! Begin by kneeling then drop the bottom back to your heels as you stretch the rest of your body down to the floor and forward, arms outstretched with head on the floor. Begin on all fours. Inhale as the belly is dropped and look up, raising your tail bone upwards(Cow). Exhale as the chin is tucked to the chest and the mid-back raised to the sky with your tailbone under (Cat). Continue these positions with a neutral spine between the movements. Start by standing with the feet together. Bend forward from the hips, not the lower back, bending the knees enough to allow the palms to press flat on the floor with the head touching the knees, if possible. To end, bend the knees keeping the back straight, the arms out to the sides and move up back into standing. Start by sitting with your left side against the wall. Turn your body to the left and bring your legs up onto the wall. Lower your back to the floor and lie down. Move your bottom close to the wall. Your arms rest by your sides, palms facing up. Lie on your back with both knees into your chest and put arms through the inside of the knees. Hold onto the outside edge of each foot. Tuck the chin into the chest and head on the floor. Press the tailbone down into the floor and push the heels up and pull back with the arms. Press the shoulders and the back of the neck down into the floor, trying to get the back and whole spine flat to the floor. Lie on your back, arms and legs open. Close the eyes, and take slow deep breaths through the nose. Allow your whole body to become soft and relaxed. To finish slowly move up to a seated position.